Apologies in advance, but this is sort of a long one. Anyhoo… In my most recent post titled “random musings”, I said this: “Otium is amazing and will get its own blog post soon.” Now, loyal readers of this little vanity project will remember that I take pride on beating mainstream publications like the L.A. Times to the punch, and then claiming that they’re riding on my coattails. Which is ridiculous, but what good is a blog if you can’t engage in some delusions of grandeur every so often?? 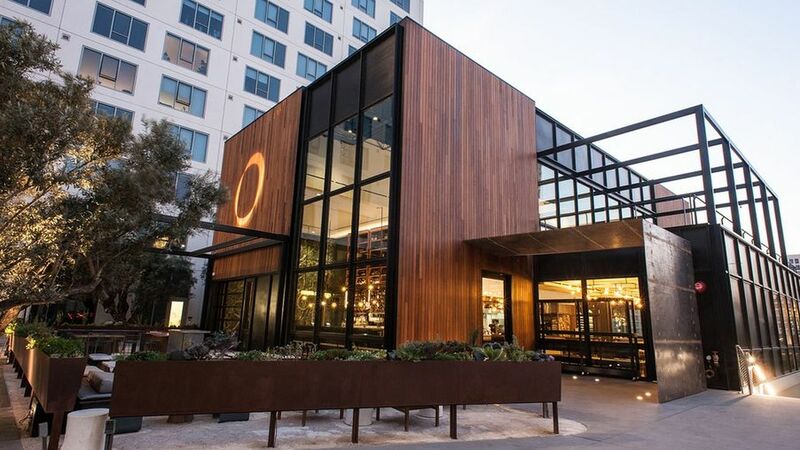 I read the review with interest as I had been thinking about Otium and I, too, love it. And slowly, something dawned on me. Something that actually relates to this whole little venture, which has been going on for a few years now (a quick look to the right shows posts going back to March 2009, which is shocking to me!). 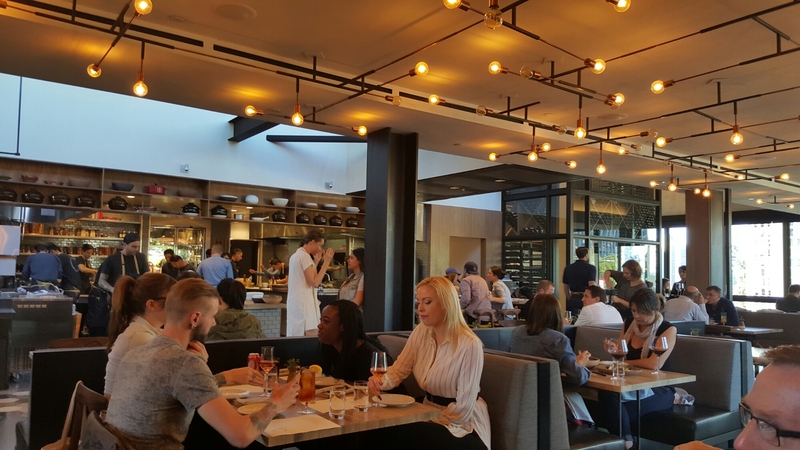 “At Otium, the new restaurant in the Broad museum complex downtown, Timothy Hollingsworth seems to be trying to do no less than to reinvent what an American restaurant might be. 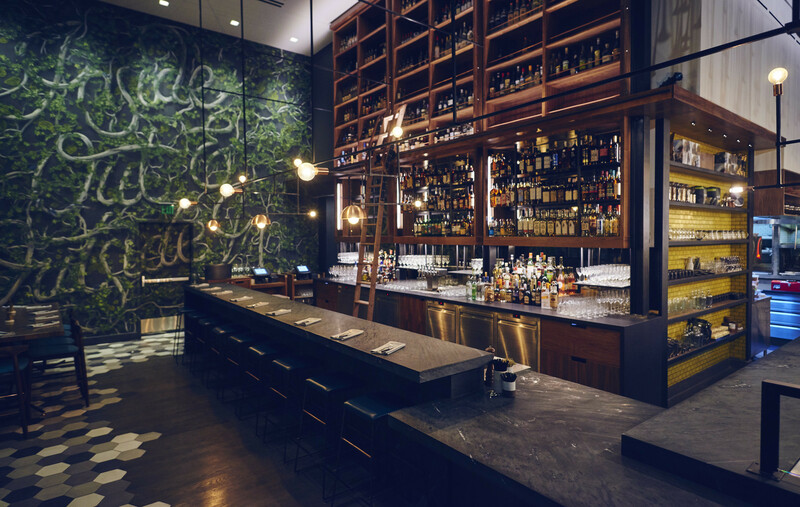 The original Spago pioneered the open kitchen, but at Otium there is not so much as a counter between the dining room and the stoves. But most of all, Hollingsworth is attempting to nudge American cooking into the conversation — not the idealized regional cuisines cataloged by people like Edna Lewis and James Beard, but American cooking as it is experienced by most of us in 2016 — falafel and shawarma, spaghetti and sushi, funnel cake and campfire-roasted s’mores. Let me be clear: I think Jonathan Gold is amazing, and a true Los Angeles treasure. The only guy ever to have won a Pulitzer for food writing, and deserves it. Nobody has done more than him to put all the various global cuisines of Los Angeles on the culinary map, whether found in a temple of high dining Downtown or a minimall in Monterey Park. But reading this review when I was thinking about what *I* would say about Otium made me realize why I always get a little uncomfortable when somebody calls me a “food blogger.” Because I rarely write about food. I don’t take or post pictures of food. I don’t describe particular dishes. And, while the quality of the food is obviously important, my opinion about a restaurant is about so many more things. The décor. The vibe. The service. Yes, the cocktails. The … accessibility. Meaning, would this place be enjoyable to some critical mass of people? Few people go to restaurants to get a particular dish or because it “signifies” something or in order to compare it to some other restaurant. In fact, people go to restaurants all the time for all sorts of things besides the food. The atmosphere. The location. The service. Familiarity. I mean, yes, the food can’t be *bad*, and there are plenty of restaurants you choose because the food is especially good, but food is just one of many reasons that people choose restaurants. So, you’ll note that in my reviews, I always start with the décor and the vibe. The pictures I pull down are always of the design, not the food. I always put places in context – do they achieve what they are going for? I always love places that are “better than they have to be.” And I hardly ever mention specific dishes. Sure, I’ll talk about the food being good, and maybe I’ll talk about a specific dish if I think it’s worth knowing about, but that’s certainly not the main point. I’m generally not going to comment on the rubberiness of the pine nuts in a given dish or discuss whether the chef likes to play with the “intensity of brininess” (both quotes from Gold’s Otium review). And when it *does* come to food, most people eat so much differently than critics do. I submit that the way most critics discuss food (though Gold is better at this than most) is pretty divorced from what the vast majority of diners want to eat and/or why they choose a restaurant. To take but one example among many: there’s a restaurant in Silverlake called Night & Market Song that has made countless top 10s/best of LAs/critical darling lists. First, given that I always start with décor/vibe, it’s relevant that the restaurant is basically unremarkable tables, plastic chairs, and bad 80s art on the walls. Which is fine – it’s a choice – but scant few reviews mention this, and it’s relevant. If you just read how amazing the food is and think you’re in for a “night out at a great restaurant”, you will be sorely disappointed. Second, here is a representative sample of some of their menu items: grilled fatty pig neck. salty like bacon. w/ ‘jaew’ northeastern chile dip … earthy northern style larb of hand-chopped pork, pork liver, pork blood, & a dry spice mix hand-carried back from the motherland by chef Kris … fried larb “meatballs” (4) of pork, pork liver & pork blood. served over shredded cabbage, topped w/ garlic oil & rau ram … sour fermented pork sausage. eat w/ raw cabbage, chile, peanuts. served a lil pink on the inside. These items are not the “outliers” – this is a pretty representative sample of what’s on the menu. And that’s fine, it really is. But, again, it’s just relevant to *know* that. I’ll give Jonathan Gold credit here – while his review is full of high praise, he does make clear that the restaurant isn’t fancy and that the menu is challenging. But as someone who follows a lot of restaurant press, his review is the exception, not the rule. Much more of the press is a lot more along the lines of “if you want real, traditional Northern Thai food, then this is the spot.” Sounds awesome to me … until I sit down and realize that it’s very difficult to choose a meal of food I actually recognize and/or doesn’t make me a little queasy. And I’m pretty adventurous. And I feel like this is true more often than not when it comes to ‘important’ restaurants. Another for instance: in the LA Weekly’s review of Broken Spanish, Besha Rodell says that a tamale stuffed with lamb neck is “exciting comfort food.” Without knowing this for sure, I would wager a fair amount of money that I could poll every diner at Broken Spanish for a month, and a) a fairly small share of them would order that dish and b) an even smaller number would call it ‘comfort food’. Which leads to probably my biggest pet peeve when it comes to restaurants: I don’t care if you want to let your chef freak flag fly, or cook things that are obscure critic bait. But you’re running a restaurant. You know, one that’s open to the public and you want people to eat at. So, give us *options*. I know some chefs want to be “uncompromising” and, given that this is a free country and all, I suppose it’s fair to say “this is what I want to cook – eat it or don’t.” But for me, I just sometimes find it arrogant and, frankly, indulgent to serve willfully obscure and/or difficult food as your default. (To be clear here, I’m not saying Broken Spanish is like this – they actually offer an array of stuff. It just reminded me of the point). I don’t mind a few of these dishes because there are certainly adventurous eaters out there who want to explore everything a creative chef has to offer. But for me, I want them to be the exceptions on the menu, not the rule of the menu. It shouldn’t be a whole menu of “foodie” stuff, and then one throwaway chicken or steak or salmon dish. Another example: one of the reasons that Providence will always be one of my most favorite restaurants is the following: I went with a friend for my birthday a couple years back. Given that it was my birthday and I got to choose, it wasn’t until we sat down that he said he doesn’t really eat fish. What the hell?? (In case you don’t know, Providence is famous for its seafood – I wasn’t even sure they sold anything BUT seafood.) OK. Crap. But he says he’ll be fine, and he’s easygoing, so we go with it. He orders a steak. But get this – he orders it well done. Now, in case you don’t know this part, chefs HATE cooking meat well done. It’s dry and it’s almost impossible to cook with any level of flavor remaining. Many chefs refuse to do it. So here we are, at a temple for seafood, and my friend orders red meat at a temperature that even many steak restaurants refuse to offer. And it was the best steak he’d ever had. THAT is a restaurant committed to giving customers what they want, with the same commitment to excellence at every level. So … I’ve made my point here. For me, at least, I’m not writing for “foodies.” I’m not trying to point you to particular dishes, or talk about how some restaurant fits into the larger food world. I’m much more concerned with how a restaurant fits into its *neighborhood*. How it relates to other restaurants near it – Downtown has a number of great Italian restaurants, so if another one opens, I’m going to look at whether it’s worth going to in relation to the others. But “worth going to” doesn’t only mean “is the food better?” It also means “how is the design? how is the service? does it have enough menu options to appeal to a wide variety of people? does it somehow offer something unique or different?” Bottom line: I’m always thinking “is this place worth someone driving to Downtown (or wherever), finding parking, and generally wrestling with LA traffic and hassle to try out?” And, to me, the answer to those questions goes so far beyond food. So, that was my epiphany. I’m not really a food blogger. I’m a restaurant blogger. I like the whole *experience* of restaurants. And sure, food is an important part of that. But only part. And I’d wager that most people agree, whether they articulate that or not. Sure, we hear about the people who drive hundreds of miles just to try a particular place, or offer up their first born to get a reservation at a hotspot. But they are the exception, and I’m more interested in the 98% of us who just want a nice night out, or a good lunch, or a fun time with friends. Great restaurants facilitate all those things, and that’s what I’m interested in. Finally, back to Otium. Given that my word count is telling me I’m already at 2,200 words, I’ll keep this short. Otium is awesome. Here are the de rigeur pictures. So … it’s a dramatically cool spot. Especially in its jewel box setting next to the Broad Museum. And the food really is great. What’s especially so great about it is the variety. There’s literally something for almost anyone, which is really hard to pull off. And it kind of does the small plates thing, which I don’t always love, but it works here. The dishes truly are sharable, and I haven’t had one yet that was disappointing. Sure, some are always better than others – get the pork belly, even if you don’t like pork belly – but they’re all good. And yes, the service is amazing, and the vibe works. It feels like an ‘important, cool’ place. It’s not that I “want” that, but this place is going for big, and it achieves big. Which is hard. And the fact that it’s doing that right from the start shows some pretty amazing restaurant chops. So anyway. Apologies for the length and the quasi-diatribe. But now you know to call me a “restaurant blogger” instead of a “food blogger.” And next time we go to lunch, please don’t say “I’d never think to suggest a place to you – you know all the cool spots.” I mean, sure, OK, I keep on top of this stuff. But I really, truly don’t care. I just want wherever we go to be accessible, convenient, decent, and I’m there to talk to you. The food? I’m fine with whatever.